Lack of access to clean drinking water is a crisis that is holding back human progress, consigning large segments of humanity to lives of extreme poverty, vulnerability, and insecurity. In a world of 7 billion people, 884 million of them lack access to a clean, safe water source. Dirty water is the single largest killer in the developing world. The statistics are staggering: every fifteen seconds a child dies from contaminated water. 88% of the world’s diseases such as diarrhea, intestinal worms (see video below) and cholera are caused by unsafe drinking water and inadequate sanitation. Clean water changes everything. Access to safe, clean water is the most important element in the reduction of under-five mortality. Access to safe, clean water eradicates water borne illnesses in communities suffering repeated bouts of debilitating disease. Safe, clean water is foundational to health and providing for a family. Many women spend 15-20 hours per week collecting water, often walking up to 7 miles in the dry season. It is typically women who collect water, often waiting for long periods, and having to get up very early or go out late at night to get their water; they carry heavy water containers for long distances over uneven terrain. It is women who have to buy, scrounge, or beg for water, particularly when their usual sources run dry. The tragedy is that the water they work so hard to collect is often dirty, polluted, and unsafe to drink. Women trapped in this situation have little time for other activities such as child care, rest, or productive work. The time spent collecting water marginalizes women by reinforcing poverty and lowering income. Water-related diseases cost African children 443 school days each year. 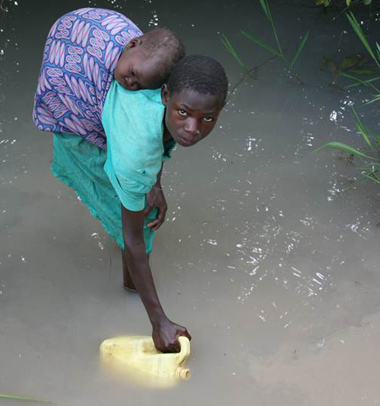 Children who suffer from constant water-related illnesses carry the disadvantages into school. Poor health directly reduces cognitive potential and indirectly undermines schooling through absenteeism, attention deficits, and early drop-out. In Sub-Saharan Africa alone, 40 billion hours of labor are wasted each year carrying water long distances. Without easy access to safe water, countless hours are spent in water collection and household income is spent on purchasing water and medical treatment for water-related diseases. These factors contribute to keeping people trapped in poverty. The statistics indicate a two-way relationship between extreme poverty and lack of access to safe water. “Water management is a key factor in the global battle to remove the scourge of extreme poverty and to build secure and prosperous lives for hundreds of millions of people in the developing world.”- World Health Organization, 2007.